Eareckson's primary missions are the operation and maintenance of the 10,000 foot airfield supporting the northern Pacific air bridge, and the support of several differing tenant units and non-tenant activities located at Eareckson. Its location in the middle of the northern Pacific Ocean makes it an ideal refueling stop for military aircraft flying between North America and Far East Asia. Eareckson also serves as a divert field for in-flight emergencies, and a base for search and rescue efforts in the Northern Pacific. Eareckson Air Station, formerly known as Shemya Air Force Base, is located on the island of Shemya, Alaska. The base was also referred to as "The Black Pearl" or "The Rock." It is the most westerly of the 11th Air Force bases and is located approximately 1,500 miles from Anchorage near the tip of the Aleutian Island chain. The once uninhabited island was first occupied by military forces on 28 May 1943, during the final days of the battle to retake nearby Attu from the Japanese. Shemya was originally intended as a B-29 base for the bombing of Japan. The present day 10,000-foot runway and Birchwood hangars were constructed to accommodate the bomber. However, the Joint Chiefs of Staff decided to employ the B-29s from China and the Mariana Islands in the central Pacific. Shemya, instead, became the home of the 28th Bomber Group whose B-24s flew bomber and photo-reconnaissance missions against the northern Kurile Islands while its B-25s, based on Attu, attacked Japanese shipping in the North Pacific. The Group was deactivated in October 1945. Air Force activities were reduced after World War II and for a time the Air Force considered transferring the island to the Civil Aeronautics Authority, the forerunner of the Federal Aviation Administration. However, the Air Force decided to retain Shemya because its location provided an ideal refueling stop on the Great Circle Route, particularly during the Korean War. The 5021st Air Base Squadron (AAC) provided base support. Following the Korean War, Shemya was declared surplus and the base was deactivated on 1 July 1954. The facilities were turned over to the Civil Aeronautics Authority in 1955. They were then leased to Northwest Orient Airlines who remained on the island until 1961. In 1958, the Air Force resumed operations on Shemya in support of various Air Force and Army strategic intelligence collection activities. Shemya also continued to support the Great Circle Route. The 5040th Air Base Squadron was activated on 15 July 1958 to provide base support. The squadron was redesignated the 5073rd Air Base Squadron on 1 October 1962, and upgraded to a group on 15 October 1974 in recognition of the number and complexities of the tenant units it supported. Shemya was redesignated from an Air Force Station to an Air Force Base on 21 June 1968. The Cobra Dane AN/FPS-108 Phased Array Radar facility was constructed during the mid-1970s as a replacement for the AN/FPS-17 Detection and AN/FPS-80 Tracking Radars used to monitor space and missile activities. Cobra Dane was declared operational on 1 August 1977. It was transferred from the Aerospace Defense Command to the Strategic Air Command when the former was inactivated on 1 October 1979. It was transferred to the Air Force Space Command on 1 May 1983. Shemya Air Force Base has been the scene of two major earthquakes. The first, measuring 8.7 on the Richter scale, occurred on 3 February 1965 at 1901L centered at the nearby Rat Islands. It was followed by severe after shocks and a 10.7 meter tsunami. Damage, however, was limited to cracks in the taxiways. The other earthquake, measuring 7.6 on the Richter scale, occurred on 1 February 1975 at 2243L, with a high degree of damage to the runways and hangars. Communications were disrupted for a short period of time. During the 1980s the facilities on Shemya were upgraded. Many of the old World War II structures were replaced with modern buildings and new facilities were built. On 27 January 1992, the 5073rd Air Base Group located at Shemya AFB was redesignated as the 673rd Air Base Group. The 673d and the base were then reassigned from 11th Air Force to the 11th Air Control Wing. On 6 April 1993, Shemya AFB was renamed Eareckson Air Station. The renaming ceremony was held 19 May 1993. The Eleventh Air Force Association initiated renaming the base to honor their war-time commander, Colonel William O. Eareckson. From 1941 - 1943, Colonel Eareckson personally led all of the difficult missions against the Japanese which were located on two other Aleutian Islands, Kiska and Attu. The colonel also helped plan the successful retaking of Attu. During the bombing campaigns, he introduced low-level skip bombing and forward air control procedures long before they became common practices in other war theaters. The 673rd was reassigned to the 11th Air Force on the 1 July 1994, inactivation of the 11th Air Control Wing. The 673d Air Base Group provided base support to various tenant units assigned to other Air Force commands, such as the Air Force Space Command and other agencies involved in intelligence gathering activities directed by the National Command Authority. 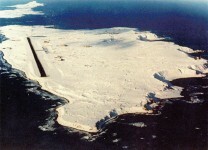 On 1 April 1995, Eareckson Air Station was converted to contractor operations and maintenance with Piquniq Management Corporation (PMC) providing all support on the Island. On On 1 June 2000, Chugack Eareckson Support Services (CESS) (A joint venture between Del-Jen, Inc. and Chugach Development Corporation), became the Base Operations and Support (BOS) Contractor. On 13 September 2001, CESS, Anchorage, Alaska, was awarded a $10,633,384 firm-fixed-price contract modification to provide for fiscal year 2002 operations, maintenance and support of Eareckson Air Station, Alaska. At this time, no funds have been obligated. This work is to be completed September 2002. CESS will perform this effort at Eareckson Air Station, Alaska. The Missile Defense Agency (MDA) planned to construct, during a two- week period, an X-Band Radar (XBR) on Shemya, AK. Wind speeds must not, at any time during the construction, exceed a 25 knot limit set by the MDA for lifting the massive dome panels into place. The goal of this research was to explore the possibilities of long-range forecasts to determine the feasibility of predicting any upcoming two-week windows of opportunity, well in advance, that will ensure the successful completion of constructing the XBR on Shemya. In order to reach this goal, the following objectives were achieved; (1) a climatological wind study for Shemya to assess the optimal climatological window to build the XBR, (2) a detailed synoptic study over the North Pacific, to gain an understanding of how synoptic weather systems develop, move, and vary on an annual basis, (3) a traditional statistical analysis of the data followed by a Classification and Regression Tree (CART) analysis for pattern recognition of global teleconnection indices, and (4) develop forecasting decision trees to assist the 11th Operational Weather Squadron (OWS) Alaskan forecast hub in this daunting task. The Aleutian Island chain is plagued by persistent strong winds, since the Aleutian Low and expanding polar vortex affect the region in the winter, as do tropical storms and frontal passages in the summer. This, combined with Shemya being located near the exit region of the climatological storm track off the East Asian continent, makes the island one of the most challenging forecast locations in the Northern Hemisphere. This study compares surface winds and teleconnection indices, as computed by the Climate Prediction Center (CPC), to statistically analyze the data. The data were analyzed using standard statistical regression techniques, including linear and multiple linear regression methods, and then CART analysis was used for large-scale pattern recognition.